More children than ever are experiencing stress, anxiety and depression. According to the Mental Health Foundation, nearly one in 10 children and young people aged five to 16 are affected by a mental health problem. In the digital age that we live, many children spend large amounts of time on phones, laptops and computers. Reducing quality, face to face time with family and friends. There are greater pressures academically too. Due to the ever-increasing demand for tests and exams. A study carried out by the NSPCC found that academic worries accounted for 50% of children’s stress. As adults, we are aware of the importance of having moments in the day, when we can just be. Whether this be sitting quietly, reading a book or allowing our minds to wander and daydream. 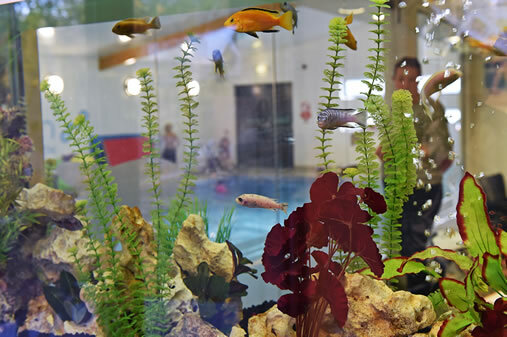 To provide a designated relaxation area within schools for children, one including an aquarium, could be extremely beneficial at improving both mental and physical health. A study carried out by the National Marine Aquarium, Plymouth University and the university of Exeter, noted the physical and mental responses of people looking at aquariums with varying levels of fish. Researchers discovered that watching fish swim improved mood and kept peoples’ attention for longer, as well as noticeably reducing blood pressure and heart rate. The most important fact to be taken from the study is that people felt instantly relaxed. The hypnotic effect of watching fish swimming back and forth has also been proven to help children calm down and relax. A natural and therapeutic tool to help children suffering with conditions such as ADHD and autism. So, there we have it! Watching fish not only lowers blood pressure and heart rate but reduces stress and anxiety, improves mood helping us to feel calm and relaxed.